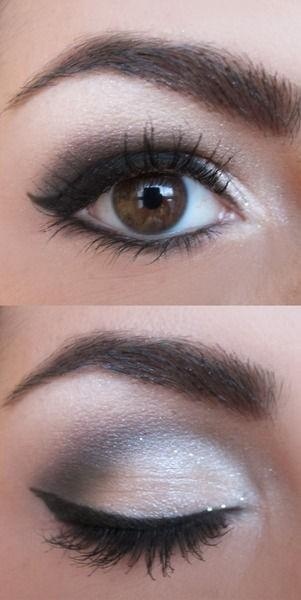 Eyeshadow serves to enhance your eyes. Here we will discuss the basics of how to apply eyeshadow. Its important to pick your shadow shades in groups of three; one for your brow bone or under brow (highlighter), one for the eyelid (medium colour) and one for contouring along the crease (this is usually the darkest shade). They should be in the same colour family or at least blend well. Then eyeshadow base, applied to the eyelid with a soft shadow brush. 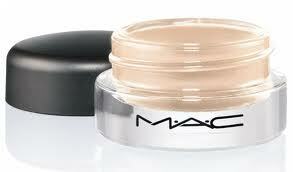 This will keep eye make up from creasing and helps the colour last longer. Choose three complementing eyeshdow colours that are light, medium and dark in intensity. The medium colour is the base, the lightest colour is the highlighter, and the darkest colour is the contour. 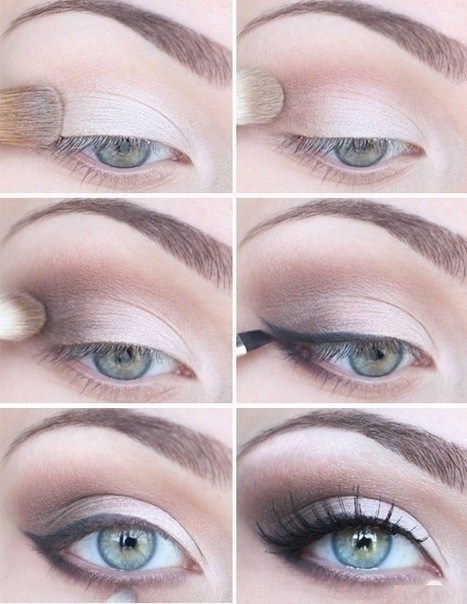 Using an eyeshadow brush, apply the medium colour onto the main area of your eyelid that is directly over the eyeball; go slightly into the crease (labelled 2 in the diagram below). 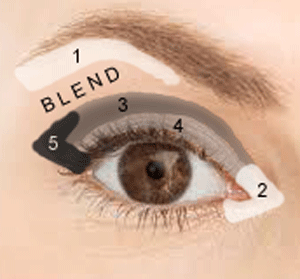 Now apply the lightest colour, or highlighter above the medium colour and up to the brow using an angled brush and a tapered blender (labelled 1 and blend in the diagram below). Sweep it out slightly at the outside edge as you did the first colour. Apply the darkest colour, or contour to the crease (labelled 3 in the diagram below) using the pointed tip of the eyeshadow brush and a light hand. Apply a bit of the dark colour just to the tip of the brush, then make a thin line starting at the inside corner of the eye and make the line wider as you move toward the outside of the eyelid. Continue with the darkest colour just past the edge of the crease of your eyelid and bring the tip back to touch the outside edge of your lashes forming a greater than sign (>) labelled 5 in the diagram below. Soften the line of the dark contour colour with either a Q-tip or clean brush tip and smudge it into the lashes slightly. Apply eyeliner and mascara to pull the look together and you're finished! #964 Blusher - Powder/blush application and it can be used to dust on face powder as well. #948 Foundation - Liquid and cream foundation, or concealer as it has a tapered tip and can be used to apply cream blush too. #942 Slanted contour - Finally, you can place contour colour where you want it to be. This brush can also double as a blush brush. #785 Tapered Blending - A good blending brush that can be used on the eye crease for contouring and to apply highlight shade. It can also be used to apply concealer for an air-brush effect. 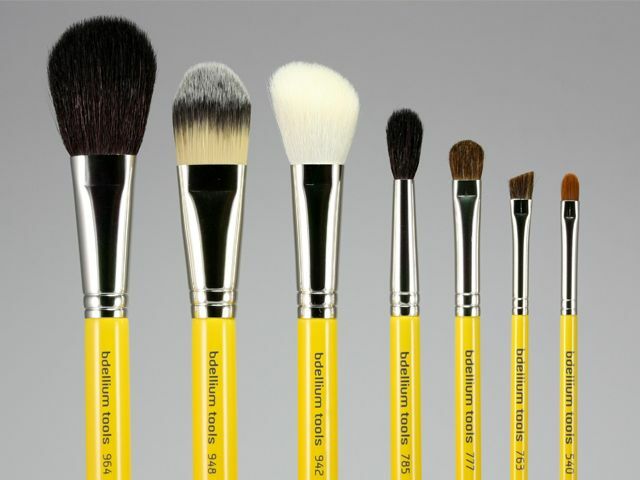 #777 Eye shadow - This brush handles powder/loose eyeshadow very well because of the dense bristles. It has a slight point on the tip so it can also be used to apply crease colour. #763 Angled brush - I love this brush. It can be used for highlighting the brown bone/under brow. Its also good brush for applying gel or liquid brow fillers and eyeliner. #540 Precision Liner - Lipstick brush which aides precision lining. Its also good for concealing spots.